"What sort of society have we become when the health of hundreds of thousands are sold to save just £2.50 a day?" 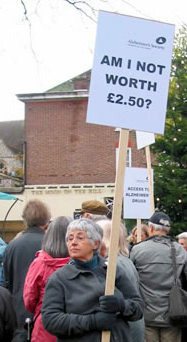 The decision to deny life-changing drugs to thousands of people with Alzheimer’s at a saving of just £2.50 a day triggered protest marches across the country on Friday 17th November 2006. The nationwide action brought together people with Alzheimer’s, carers, doctors and MPs, marching against the recommendation by the National Institute for Health and Clinical Excellence (NICE), to refuse access to treatments for people in the early and late of Alzheimer’s disease on the NHS. Co-ordinated by the Alzheimer’s Society, more than 30 protests took place across England and Wales, including rallies in London, Manchester, Southampton and Newcastle. Protestors armed with placards, petitions and thousands of signatures met with MPs supporting the Alzheimer’s Society call for doctors to have greater flexibility in prescribing treatments. "What sort of society have we become when the health of hundreds of thousands are sold to save just £2.50 a day? This blatant cost cutting will rob people of priceless time early in the disease and later clinicians will have no choice but to use dangerous sedatives that increase the risk of heart disease and stroke. This is victimisation of the most vulnerable in society and today is an opportunity for people to take a stand." The guidance from NICE comes into force in less than a week, on Wednesday 22 November, despite five appeals and widely acknowledged problems in the appraisal of drug treatments. More than 125 MPs have already signed an Early Day Motion (EDM) demanding action from the Department of Health to make sure doctors continue prescribing treatments in the best interests of their patients. Celebrities Richard Briers, Fiona Phillips and AA Gill are among those supporting the campaign. Children’s presenter Richard McCourt and Russell Grant led marches in Sheffield and North Wales, with Linda Nolan in Bradford and actress Nicola Duffet supporting the rally in Sutton. "These drugs have given me so much. I used to wander lost and confused but now I can play with my grandchildren, tell my wife I love her and do things for myself again. This is a priceless gift." Eisai and Pfizer, the manufacturers of one of the drug treatments for Alzheimer's, have informed NICE that they intend to apply for a judicial review against its decision to restrict access to Alzheimer's drugs. Although the Alzheimer's Society is not involved in this legal action and is seeking legal advice as to whether to launch its own judicial review against the decision in the High Court, our Chief Executive, Neil Hunt welcomed the news. "It’s great news that NICE will be challenged in court. This has been a flawed process from start to finish. NICE holds the fate of thousands of people’s lives in its hands and it is only right that it is brought to account. The Alzheimer’s Society has also been seeking separate legal advice as to whether to launch its own judicial review against this decision in the High Court. NICE’s decision to deny people in the early and late stages of Alzheimer’s disease access to drug treatments is cruel and unethical. That is why thousands of people across the country are taking to the streets today (17 November) to voice their outrage. This devastating decision was due to come into force next week, surely NICE must now postpone issuing this guidance until all legal challenges have been heard." The Alzheimer's Society has over 25,000 members and operates through a partnership between over 250 branches and support groups and the national organisation in England, Wales and Northern Ireland. It was founded in 1979 as the Alzheimer's Disease Society.